A system as complex as your garage door requires an expert technician's assistance when some part of it breaks down or starts acting up. Our team can help you deal with these situations when they occur, and provide you with an affordable and long lasting solution. The parts of your garage door that are responsible for supporting the weight of the panels are the springs. These metal coils are under a lot of tension on a day to day basis, and for that reason can go whipping around your garage when they finally break. Not only that, the door could also collapse as a result. Needless to say, handling these components can be extremely dangerous, and you should always contact our team the moment you notice something's wrong with them. The opener is what allows your garage door to open and close automatically. Since it is an electro-mechanical device, it can suffer from a variety of malfunctions, ranging from a worn out motor gear all the way to a fried circuit board. Our experts can perform any necessary opener repair or replacement, and ensure that your door returns to it's proper operation as soon as possible. Your garage door tracks are the guiding rail your system uses to ensure the door is moving properly and evenly. If this component develops some bends, or gets too dirty or blocked by debris, it could cause your door to get stuck. When this type of thing happens, you can rely on our professional technicians to quickly straighten the dents in the track and even replace the entire thing if it proves to be necessary. 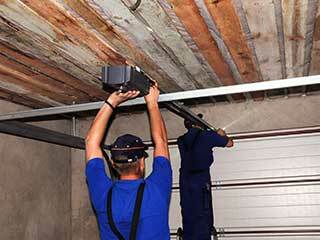 No matter how complex your problem seems to be, our experts at Garage Door Repair Portland can quickly solve it. We specialize in repairing these types of automatic systems, and no issue is too big for our team to handle. Call us today.